Happy Valentine's Day my lovelies! 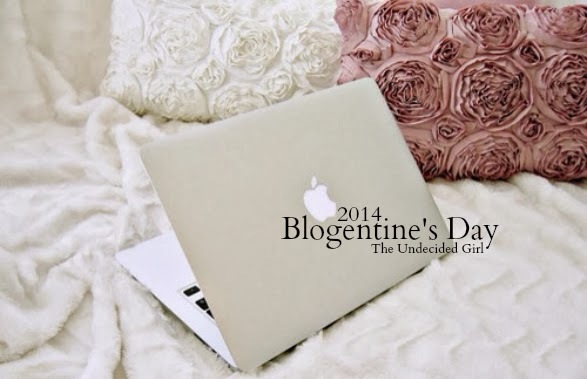 I am so excited to participate in Blogentine's Day, put together by my lovely friend Jocelyn! It's basically taking the time on Valentine's Day to show love to your favorite bloggers…and I could't be more excited! Sarah Smile has brought me to so many wonderful people and I could't be more blessed to have those amazing relationships! Being friends with bloggers is different than my friends who have known me forever and see me everyday, but in so many good ways! They get me and why I love blogging without me having to explain it and they understand the irrational need to blog about certain things or have the perfect graphic for a post! It's nice to have people who just get it, ya know? So without further ado...here are some of my blog bezzies! Amy Oh Amy. Amy was the first blog bff that I ever had and I remember when I first tweeted her and was so excited when she tweeted back about meeting up in London some day! Never would I have imagined we'd be here almost a year later but my family and friends have literally not stopped hearing about her since we started tweeting way back when! I attribute a lot of the reason for me starting Sarah Smile to loving her blog and wanting to be like that and I just feel so blessed for meeting her! She is always so helpful and supportive and we have SO many things in common and she's just an all around cool person! I don't know how I ever would've picked schools in England and learned so much without her and I can't wait to hang out in London with her! Jocelyn Jocelyn was the first reader to ever email me (at least I think so!) and she won my first giveaway! It's so neat that we are the same age (at least school wise) but we are so different..as in she's from Canada and has a boyfriend and I am from way South and way single. (; Everytime I ask about an idea or need a bit of a confidence boost, I can always turn to our group chat and I just love it! When I got this email I was in the car with my friends and I made them all stop and read it…#diva…and it still makes me smile when I read it! McKenna When I think of McKenna I just think she's so cool. I honestly wish I was that cool in high school. I honestly read her blog and I'm like "She dresses cool, and she thinks cool things and listens to cool music and why am I not cool like that?" But really though, I always used to see her and Amy's tweets and get jealous, so now I'm glad that I get to be friends with her too! We all have the best conversations about things that I can't/don't necessarily talk to my friends about and it's amazing. Meredith To me, Meredith is just balls of sunshine and light! Does that makes sense? I don't remember exactly how I came across her blog (maybe Southern Blog Society), but the moment I tweeted at her she was just so kind and lovely! I love her posts because I can relate to them so much and every time she tweets at me it cheers up my whole day! She is so helpful and wonderful and such a blessing to me and Sarah Smile (and also my pinterest)! Vina Talking about getting jealous of people who tweet at Amy (this post has taught me some serious things about my friendship obsessions…scary), I always saw tweets and Instagram comments with Vina but I was always too nervous to reach out to her! When she emailed me the sweetest email about wanting to be friends I almost melted! I have been horrid about actually replying, but talking to her has been so much fun and I love her blog! She was the sweetest right off the bat and I know we are going to be great friends! All in all, these girls have been such supportive loving blessings in my life and I couldn't ask for more! Reading their posts, seeing their instagrams, and tweeting/emailing with them is so fun and encouraging and I can't say enough how having an awesome group of blog friends has changed my life in these short 5 months! Lastly, I just want to say that all the lovely comments, tweets, and emails from you guys reading these things is a huge light and blessing in my life. I never thought that I would have so many people (outside of my family and friends who are forced) support this little bit of internet and I can't say thank you enough. Whether I'm having the best day or the worst, getting sweet little comments from you guys about connecting to what I said or understanding what I'm struggling with means so, so much! On that note, love you all and hope you have an amazing day! You all deserve it! P.S. - If you're still looking for something to bake or make for Valentine's Day, I've got just the thing for you! Check out the best (easiest) V day desert and the cutest little DIY Valentine! AHH I knew you were going to post the screenshot! I love it and you Sarah! Thank you for joining in on Blogentine's Day girl.